This recipe is an excellent source of protein, niacin, vitamin B6, vitamin B12, selenium and zinc; and a good source of fiber and iron. Place beef steak and 1/2 cup marinade in food-safe plastic bag; turn steak to coat. Close bag securely and marinate in refrigerator 6 hours or as long as overnight, turning occasionally. Cover and reserve remaining marinade in refrigerator. Set aside 2 tablespoons of Italian dressing for ratatouille. Brush vegetables (except tomatoes) with some of the Italian dressing. Grill eggplant and bell peppers 12 to 15 minutes; zucchini and yellow squash 8 to 12 minutes or until tender, turning occasionally and basting with remaining reserved marinade. Cut grilled vegetables into 1-inch pieces. Carve steak into thin slices. Cover and refrigerate 1 cup of vegetables and 1 cup of steak slices to use in Steak and Grilled Vegetable Salad. For ratatouille, combine remaining vegetables, tomatoes, basil and 2 tablespoons Italian dressing in medium bowl; toss to coat. Season ratatouille and remaining steak with salt and black pepper, as desired. Serve ratatouille with steak. Whisk vinaigrette ingredients in small bowl until blended. Divide salad greens between 2 serving plates. 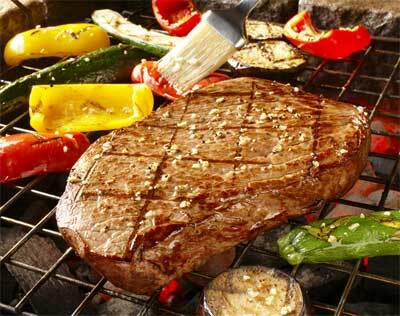 Arrange beef steak slices, grilled vegetables and tomatoes evenly over greens. Drizzle evenly with vinaigrette; top with cheese, as desired. Nutritional Information Per Serving Nutrition information per serving: 339 calories; 20 g fat (4 g saturated fat; 13 g monounsaturated fat); 61 mg cholesterol; 310 mg sodium; 10 g carbohydrate; 4.7 g fiber; 30 g protein; 6.2 mg niacin; 0.6 mg vitamin B6; 1.5 mcg vitamin B12; 4.3 mg iron; 31.1 mcg selenium; 5.4 mg zinc.